(4060, Frederick S. Barde Collection, OHS). Located in west-central Oklahoma, Blaine County is bordered by Major County on the north, Kingfisher and Canadian counties on the east, Caddo County on the south, and Custer and Dewey counties on the west. Named for Speaker of the U.S. House of Representative James G. Blaine, the county encompasses 938.88 square miles of land and water. The North Canadian River bisects Blaine County from the northwest to the southeast. The Cimarron River crosses the northeastern edge of the county, and the Canadian River cuts across the southwest portion. As to physiographic region, the northeastern half lies on the western edge of the Red Bed Plains and the southwestern half lies in the Gypsum Hills. In 2010 the incorporated towns included Canton, Geary, Greenfield, Hitchcock, Longdale, Okeene, and Watonga (the county seat). Blaine County's prehistory is represented by seventy-eight archaeological sites. Eight sites date to the Archaic period (6000 B.C. to A.D. 1), three to the Woodland period (A.D. 1 to 1000), and sixty-seven to the Plains Village era (A.D. 1000 to 1500). Artifacts recovered from the site designated as 34BL46 include two points that probably date to the late Archaic or Woodland periods and pottery shards indicative of the early Plains Village era. After the Louisiana Purchase (1803), which included present Oklahoma, explorers and traders such as Maj. Stephen Long (1817), Thomas James (1821), John McKnight (1821), and Josiah Gregg (1839–40) traversed present Blaine County along the rivers. Capt. Nathan Boone, who reconnoitered from Fort Gibson to western Indian Territory in 1843, crossed southwestern Blaine County on his return trip to the fort. James William Abert, army lieutenant working for the U.S. Corps of Topographical Engineers, started from Fort Bent (Colorado) to Fort Gibson, Indian Territory, following the Canadian River in 1845. Before the Civil War Jesse Chisholm had established a salt works in present Blaine County in order to trade the commodity with the Plains Indians. The area was originally the part of Indian Territory where the Creek and Seminole had been settled in the 1820s and 1830s. Following the Civil War the Reconstruction Treaties of 1866 required the Five Tribes to cede part of their lands. Thus, the Creek relinquished the western half of their lands, and the Seminole lost all their land. In 1869 the Cheyenne and Arapaho were removed from Colorado to these lands in Indian Territory. In 1879 Cantonment, a military post, was established in present northwestern Blaine County. In December 1882 Mennonites opened an American Indian school near the post. The Episcopal Church operated the Whirlwind Mission in southwestern Blaine County from 1897 to 1917. When the jurisdiction of the Darlington Agency was divided in 1903, the Cheyenne-Arapaho Agency was established at Cantonment. After the Cheyenne and Arapaho took land allotments, their reservation was opened to non-Indian settlers on April 19, 1892. The county was organized on that date as "C" County. The southwest portion of the county south of the Canadian River was part of the Wichita and Caddo reservation and was opened to settlers on August 8, 1901. Early settlers opened towns and farmed the sandy-loam soil. They grew wheat, corn, cotton, oats, Kaffir corn, broomcorn, sorghum, hay, and Irish potatoes. Cotton gins, mills, and grain elevators soon appeared in the towns of Geary, Greenfield, Hitchcock, Okeene, and Watonga. 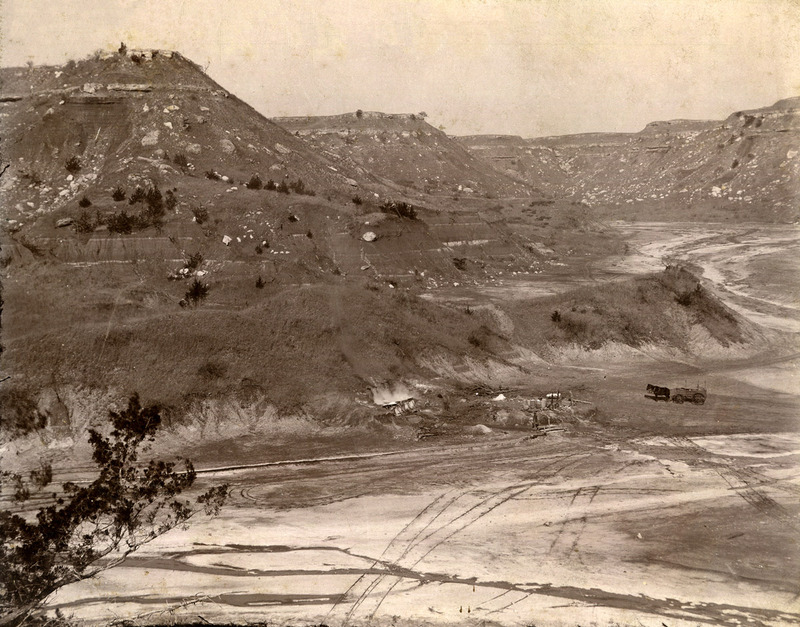 The outcropping of gypsum attracted at least six plaster mills, and a plant was established at Southard in 1905. The county court house, constructed in Watonga in 1906, is listed in the National Register of Historic Places (NR 84002972). At 1907 statehood Blaine County's population stood at 17,227, rose to 17,960 in 1910, and declined to 15,875 in 1920. Cattle drives from Texas to Kansas followed the Caldwell Trail, which was situated west of Cantonment. A military road connected Fort Reno and Cantonment. The Southern Stage Company and the Concord Stage served the citizens until railroads were built in the early 1900s. The Enid and Anadarko Railway (later the Chicago, Rock Island and Pacific Railway) constructed a line between Enid and Greenfield in 1901–02. Between 1901 and 1903 the Blackwell, Enid and Southwestern Railroad (later the St. Louis and San Francisco Railway) ran a line from Darrow, Blaine County, to the Red River. In 1905 the Kansas City, Mexico and Orient Railway finished a line from Fairview, Major County, to Oakwood, Dewey County, cutting across the northwest corner of Blaine County. After U.S. Highways 270 and 281 were constructed, the Southwest Greyhound and the Red Ball bus lines served county residents. Blaine County population peaked at 20,452 in 1930. During the 1930s several New Deal programs helped employ county residents. Through the Civilian Conservation Corps (CCC) young men built Roman Nose State Park, opened in 1937. Another CCC camp worked on soil conservation at Geary. The Watonga National Guard Armory (NR 94000491) and schools and libraries were among the Works Progress Administration (WPA) projects benefiting the county. The U.S. Census reported populations of 18,543 in 1940, 15,049 in 1950, 12,077 in 1960, 11,794 in 1970, 13,443 in 1980, and 11,470 in 1990. Prominent Oklahomans who have lived in Blaine County include authors William Cunningham, Earnest Hoberecht, Sidney Stewart, Fleta Campbell Springer, and Maud Richmond Calvert. Thompson B. Ferguson served as territorial governor. His wife, Elva Ferguson, was significant in her own right as journalist and editor of the Watonga Republican newspaper. Dr. Earl D. McBride, prominent bone specialist and founder of the McBride Clinic and Bone and Joint Hospital in Oklahoma City, once resided in Watonga. At the turn of the twenty-first century Blaine County had a population of 11,976. In 2010 there were 11,943 residents with a distribution of 79.0 percent white, 8.0 percent American Indian, 2.6 percent African American, and 0.2 percent Asian. Hispanic ethnicity was identified as 24.1 percent. In 1997 agricultural production occurred on 841 farms comprising 546,677 acres, compared to 2,709 farms utilizing 533,344 acres in the 1930s. Health care service and manufacturing provided the major employment opportunities. Points of interest included Roman Nose State Park, Canton Lake, Thompson B. Ferguson Home, and the Watonga Cheese Factory. The unincorporated town of Southard had two listings in the National Register of Historic Places: the Old Plant Office Building of the United States Gypsum Company (NR 83002074) and the Old Salt Works site (NR 83002075). Annual events included the Okeene rattlesnake hunt, the Walleye Rodeo (fishing derby) at Canton Lake, and the Watonga Cheese Festival. "Blaine County," Vertical File, Research Division, Oklahoma Historical Society, Oklahoma City. Linda D. Wilson, "Blaine County," The Encyclopedia of Oklahoma History and Culture, https://www.okhistory.org/publications/enc/entry.php?entry=BL008.